Court orders AEW to pay further £1.24m on Liverpool Museum job, reports the AJ today. AEW Architects has today been ordered to pay an additional £1.24m in damages to National Museums Liverpool, on top of the £1.2m damages awarded in July. Redevelopment of this prominent waterfront site has had a troubled life from start to finish. First came the hugely controversial ‘Fourth Cloud’ project by Will Alsop which seemed to send many Liverpudlians into orbit. Then came this bold design by the respected Danish architecture studio of 3XN Architects, but they got moved sideways halfway through the project and replaced with AEW, with the client claiming they would be cheaper and easier to control. Ironically despite being the largest newly-built national museum in Britain for more than a century the building was then nominated for the Carbuncle Cup. Of course this debate about a bold new building in a sensitive site has been played out in numerous cities across the globe. Some down-at-heel sites would gain benefit from a confident form like this, but this isn’t that kind of site: it is a hugely important location adjacent to the majestic Three Graces. I’ve visited the city many times since the 1970s and am a firm believer in contemporary architecture but this enjoyable building is not right for this site. Its geometry conflicts with the graceful older buildings alongside. At least it isn’t as bad as the new Ferry Terminal smack bang in front of the Three Graces. Liverpool has lifted itself with the Liverpool ONE development and various other new buildings, but the city needs to be more careful with its key sites. Once they are gone it is hard to tur the clock back. The opening of the Museum of Liverpool coincides with 3XN’s 25 Year Anniversary. Does that make the project even more important for you? Without a doubt! And not least because I view the Museum of Liverpool as one of the largest and most prestigious projects to emerge from the 3XN studio. The Facade on the Museum of Liverpool has a very distinct pattern. Patterns are often associated with your facades. Why is that? Traditional facades often deal with interruptions – windows for example. I wish to create a holistic kind of architecture, and a patterned façade ties the building together into one sculptural entity. By creating the pattern into a relief, as we did with the Museum of Liverpool, we give the façade an element of variation, as the changing light and shadow affect the relief’s expression. Origami is an inspirational art form for me – and it is one of the ideals that I put emphasis on when I work with the younger architects at 3XN. This is not just because of the aesthetics that come out of applying patterns, but also because using patterns can also create an efficiency in the amount of materials used in the façade’s design. This is the case in the Museum of Liverpool – here the pattern we used resulted in less wastage of stone material. Another characteristic of your work which is also quite a focal point in the Museum of Liverpool are staircases. Can you explain why you often choose to do very sculptural and central staircases? I view staircases as a central social room. It’s my experience that stairs are the generator for social interaction. People speak together when they walk together up or down a staircase. If the staircase is sculpturally executed and at the same time gives the user a beautiful overview, people will want to use it. The central staircase creates an animated central space in a building and ties together various rooms and floors in an organic way. It is also space optimizing in that people can avoid long corridors, which almost always contributes in a positive way to a building. You have a particular interest in designing Cultural Buildings. Why might this be? Because Cultural Buildings are the most challenging and enjoyable projects! The buildings we consider our most important are often Cultural Buildings. If they are designed well, they tell a story of the time, the city or nation that has brought them into being. Cultural Buildings need to be more than just their function, creating identity and awareness. This creates a requirement for the architect to interpret the symbolic potential that lies within a culture and express this through physical form. 3XN’s 25th Anniversary is just around the corner. Will you be celebrating? 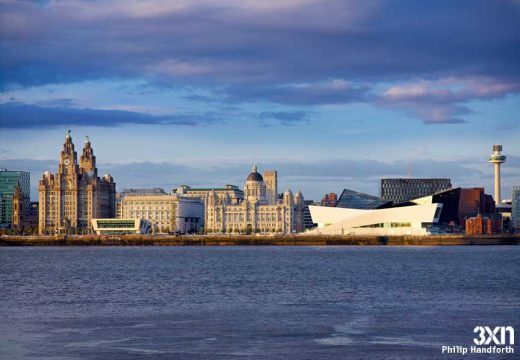 The new Museum of Liverpool, opening on July 19th will not only tell the story of its importance as one of the World’s great ports or about its cultural influence, such as with the Beatles phenomenon. It will also serve as a meeting point for History, the People of Liverpool and visitors from around the globe. Therefore, according to the Architect, Kim Herforth Nielsen, the structure functions as much more than just a Building or a Museum. As the largest National Museum to be built in the UK in over 100 years, and situated on a UNESCO World Heritage Site next to Liverpool’s famous ’Three Graces,’ Principal Architect and Creative Director at 3XN Kim Herforth Nielsen was fully aware of the magnitude of the challenge, when it came to designing the new Museum of Liverpool. The result is a dynamic low-rise structure which enters into a respectful dialogue with the harbour promenade’s taller historical buildings. This interaction facilitates a modern and lively urban space. 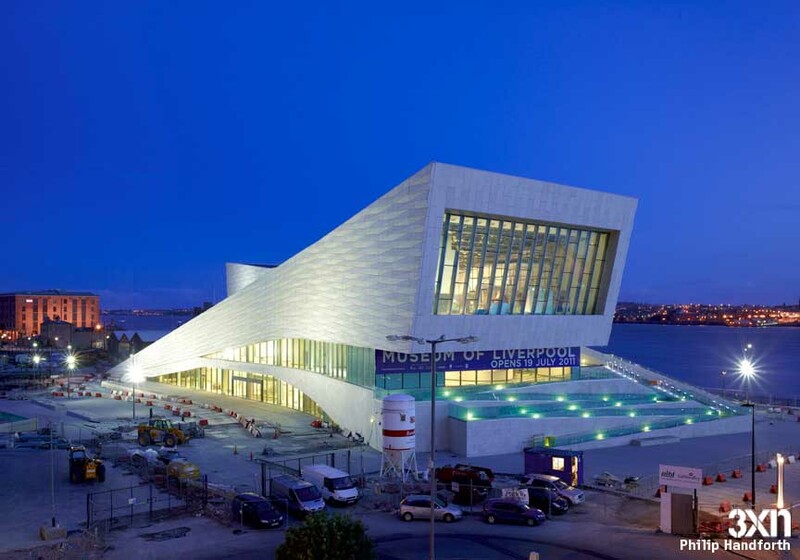 The design is reminiscent of the trading ships which at one time dominated the harbour, while the façade’s relief pattern puts forward a new interpretation of the historical architectural detail in the ‘Three Graces.’ The enormous gabled windows open up towards the City and the Harbour, and therefore symbolically draw history into the Museum, while at the same time allow the curious to look in. 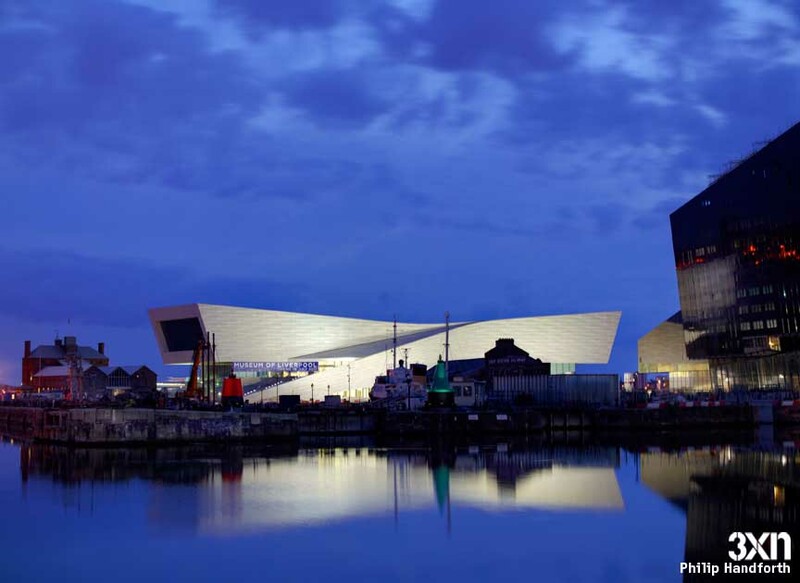 The Museum lies along the Mersey River in the center of Liverpool, and will function as a nexus, in that it physically connects the Harbour promenade with the Albert Dock, which today contains restaurants, museums and boutiques. The outdoor areas around the Museum offer seating with views to the water adding to the dynamic urban environment and serving as a meeting point for locals and visitors alike. The theme is carried through into the Museum of Liverpool’s central atrium, with its sculptural sweeping staircase leading up to the galleries further encouraging social interaction. All of these functions result in Kim Herforth Nielsen choosing to describe the Museum as a structure that unites Liverpool. The new Museum of Liverpool is housed in a landmark building at the Pier Head, at the core of the World Heritage Site on Liverpool’s famous waterfront. Located at the UNESCO World Heritage Site between the Albert Dock and the Pier Head, and next to a row of prominent historic buildings dubbed ‘The Three Graces’ the museum building is conceived as inclined or elevated platforms, gradually forming a sculptural structure. Fully accessible it will contribute to the public promenade flow along the Docks. Situated at the Pier Head, the museum will be visible from both the river and the city. The nexus of the building, the central staircase is crucial to the museum, and during the design process it was studied thoroughly in sketches, 3-D renders, and in physical models. The atrium serves as a public ‘living room’ as well as entrance lobby, providing connection to the exhibition spaces which are dispersed around it. The new Museum of Liverpool ambitions to become the World’s leading city history museum, showcasing social history and popular culture and will look at Britain and the world through the eyes of Liverpool. It is estimated that the new museum will attract at least 750,000 visitors on a yearly basis, and that Liverpool, with the Museum as a symbol of the Liverpool’s ongoing regeneration, will be elevated into the front rank of European tourist destinations, as well as providing a brilliant place for local families to find out about their own history. The 3XN winning proposal for a new British national museum; the Museum of Liverpool, envisions a dynamic, open and democratic structure that grows out of the chosen site. Museum of Liverpool is to be built at the city’s most prominent site; the listed dock area by the River Mersey, next to ‘The Three Graces’. The Liverpool Docks were inscribed at UNESCO’s World Heritage List last year. The building is conceived as inclined or elevated platforms, gradually forming a sculptural iconic structure. All surfaces will be accessible; giving way to the public promenade flow along the Docks. Situated at the Pier Head, the museum will be visible from both the river and Liverpool. The Museum of Liverpool will become the World’s leading city historic museum, and the first national museum to display popular culture and tackle social history in all its complexity. Hope is that the new Liverpool museum will attract at least 750,000 visitors on a yearly basis, and that Liverpool, with the Museum as a lighthouse, can be resurrected to new grand times, and that the visionary building will attract creative forces, generate new agendas and along the way create a new and attractive image for the city. The Museum of Liverpool will be an icon. The city has been selected for European Capital of Culture 2008, in which the new museum will be a focal point. Consequently, the museum must be built in record speed to be able open the first phase of the museum October 2008. After the Capital of Culture Year, the Exhibition construction continues.